Seemed like the battles would never end. Poor folk like myself had nary a place to sleep. That's why I keep all me things right with me. You may travel light, but methinks you bear a burden of your own. 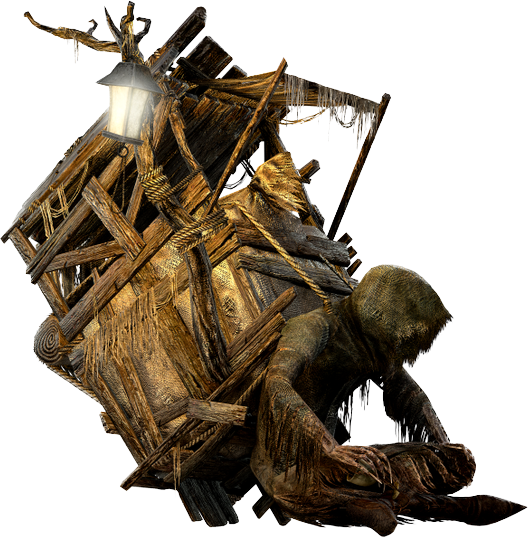 A traveling merchant who initially lives in the Cardinal Tower. Located within the Cardinal Tower next to the bonfire. After exhausting all of her dialogue and defeating the Last Giant, she will move to Majula. Sells various items. Specializes in the belongings of any NPCs you have murdered. Pate's Shield 1 5,800 Defeat Mild Mannered Pate. Benhart's Parma 1 5,000 Defeat Benhart of Jugo. Scythe of Nahr Alma 1 8,800 Defeat Titchy Gren. Mirrah Greatsword 1 10,000 Defeat Lucatiel of Mirrah. Darkdrift 1 15,000 Defeat Grave Warden Agdayne. Traveling Merchant Hat ∞ 850 Raises Item Discovery. Pate's Helm 1 3,000 Defeat Mild Mannered Pate. Pate's Armor 1 5,500 Defeat Mild Mannered Pate. Pate's Gloves 1 3,800 Defeat Mild Mannered Pate. Pate's Trousers 1 4,600 Defeat Mild Mannered Pate. Benhart's Knight Helm 1 5,000 Defeat Benhart of Jugo. Benhart's Armor 1 7,400 Defeat Benhart of Jugo. Benhart's Gauntlets 1 5,900 Defeat Benhart of Jugo. Benhart's Boots 1 6,400 Defeat Benhart of Jugo. Cale's Leather Armor 1 5,500 Defeat Cale the Cartographer. Cale's Shoes 1 5,200 Defeat Cale the Cartographer. Lucatiel's Vest 1 6,800 Defeat Lucatiel of Mirrah. Lucatiel's Gloves 1 5,200 Defeat Lucatiel of Mirrah. Lucatiel's Trousers 1 6,000 Defeat Lucatiel of Mirrah. Creighton's Chainmail 1 7,000 Defeat Creighton the Wanderer. Creighton's Chain Gloves 1 5,100 Defeat Creighton the Wanderer. Creighton's Chain Leggings 1 6,200 Defeat Creighton the Wanderer. Saint's Hood 1 3,600 Defeat Licia of Lindeldt. Increases Faith by one point. Increases number of spell uses by one for all spells. Saint's Dress 1 6,000 Defeat Licia of Lindeldt. Saint's Long Gloves 1 4,200 Defeat Licia of Lindeldt. Saint's Trousers 1 4,800 Defeat Licia of Lindeldt. Hexer's Hood 1 3,600 Defeat Felkin the Outcast. Raises Intelligence and Faith by one point. Gives 10% additional casts for all spells, rounds up. Hexer's Robes 1 6,000 Defeat Felkin the Outcast. Hexer's Gloves 1 4,200 Defeat Felkin the Outcast. Hexer's Boots 1 4,800 Defeat Felkin the Outcast. Targray's Helm 1 4,800 Defeat Blue Sentinel Targray. Targray's Armor 1 7,200 Defeat Blue Sentinel Targray. Targray's Manifers 1 5,400 Defeat Blue Sentinel Targray. Targray's Leggings 1 6,300 Defeat Blue Sentinel Targray. Nahr Alma Robes 1 5,000 Defeat Titchy Gren. Increases souls gained by 10%. Black Robes 1 6,000 Defeat Straid of Olaphis. Black Gloves 1 4,200 Defeat Straid of Olaphis. Black Boots 1 4,800 Defeat Straid of Olaphis. Chaos Robe 1 6,000 Defeat Royal Sorcerer Navlaan. Chaos Gloves 1 4,200 Defeat Royal Sorcerer Navlaan. Chaos Boots 1 4,800 Defeat Royal Sorcerer Navlaan. Agdayne's Black Robe 1 6,000 Defeat Grave Warden Agdayne. Agdayne's Cuffs 1 4,800 Defeat Grave Warden Agdayne. Pharros Lockstone 1 4,000 Activates Pharros' contraptions. Fragrant Branch of Yore 1 12,000 Restores living things from petrification. Lenigrast's Key 1 1,000 Opens Blacksmith Lenigrast's shop in Majula. Human Effigy 5 1,500 Reverses hollowing. Lifegem 10 300 Slightly restores HP over time. Unlimited after she moves to Majula. Radiant Lifegem 10 1,000 Restores HP over time. Available after she moves to Majula. Amber Herb 3 1,600 Slightly restores spell uses. Firebomb ∞ 200 Explodes, inflicting Fire damage. Witching Urn ∞ 400 Explodes, inflicting Magic damage. Throwing Knife ∞ 100 Throw at enemies to inflict damage. Brightbug 3 6k-48k +20% damage/-20% damage received for 2 minutes. The stock replenishes as you progress. Soul Arrow 1 1,500 Basic damage-dealing sorcery. Heal 1 1,500 Basic healing miracle. When 10,000 souls have been spent in her shop, she will give the Covetous Silver Serpent Ring +1. After moving to Majula, her Lifegem stock will become unlimited. Her attacks cause Curse buildup, instantly cursing players who have low Curse resistance. Go on…It's on the cheap for you. You a stranger to this land? All we get is strangers these days. Everybody's gone and run off! Drangleic's been a pile o' rubble since the war fought long, long ago. When the Giants crossed the sea. They say these trees grew from the remains of the Giants. From each carcass sprouted new life, growing into what you see now. But you know what they also say. Don't believe what an old hag says! It's high time that I pick up and move. I've a bargain for you, next time we meet, my love. Everyone's so stingy around here. You're my only customer. Don't make me beg, now, buy something! We call this place Majula. Not too special, if you ask me. It's just the place… where everyone seems to end up. I'll have your guts for garters!